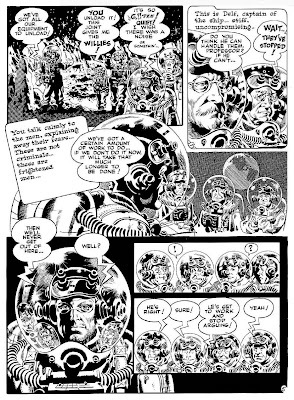 Bob Andelman interviews Andrew D. Cooke, director of Will Eisner: Portrait of a Sequential Artist. Andrew Cooke: Okay. 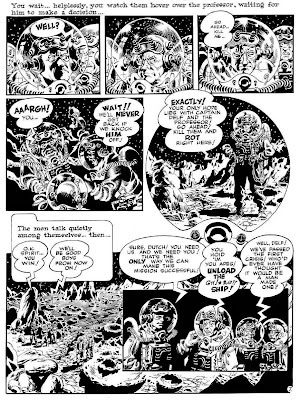 Well, my brother Jon is an editor and creator of Comic Book Artist magazine, and I grew up reading comic books. I would say the two obsessions I had growing up were comics and movies. 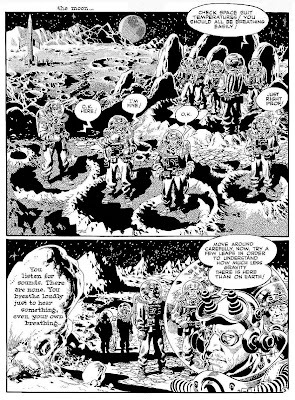 Jon and I collected all sorts of comic books, but we weren’t really aware of Will’s work until the Warren reprints came out. 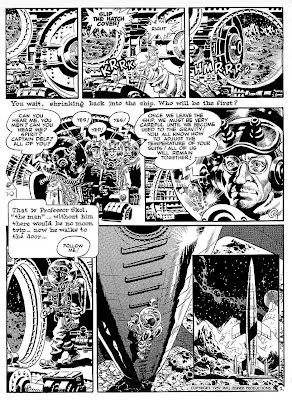 Once the Warren reprints came out, it just really hit us like, who was this guy? It was amazing work. Jon has our collection of our comics, but the things that I still retained, that I kept with me, were pristine, mint versions of those Warren issues. I loved them. After high school and college, I decided to go into the movie business, and I sort of went away from comic books, and Jon, obviously, stayed with comic books. Several years ago Jon called me. 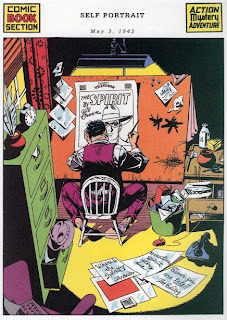 We have done several projects together and had talked about making a movie together, and he called me and said, “What about a documentary about Will Eisner?” I thought, Wow, what a great idea. So we talked about it, and we talked to Will about it, and Will said yes, and so that sort of started the process. It was as simple as that. Jon wanted to honor Will in a documentary, and I thought that that was such a great idea. I would have to say that we had hoped we would have finished the documentary while he was still with us, but the progress, it just has taken us so long to do it. Click here to continue reading interview. 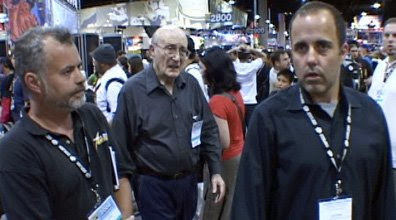 Jon B. Cooke, Will Eisner and Andrew D. Cooke in 2004. 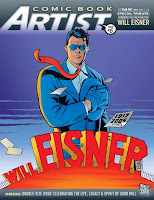 Dave Gibbons' tribute to Eisner on the cover of Jon B. Cooke's Comic Book Artist 6. For all six issues, go here. 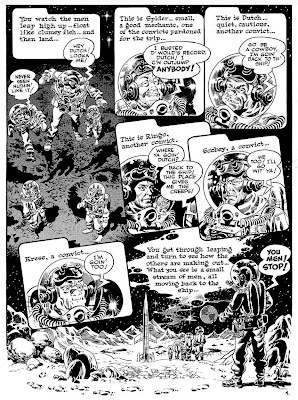 Will Eisner's The Spirit ventured into science fiction in the early 1950s. 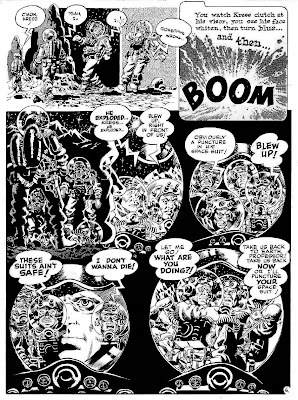 Wood, working from layouts by Jules Feiffer, drew eight weeks worth of Spirit strips which ran from July 1952 to October 5, 1952. 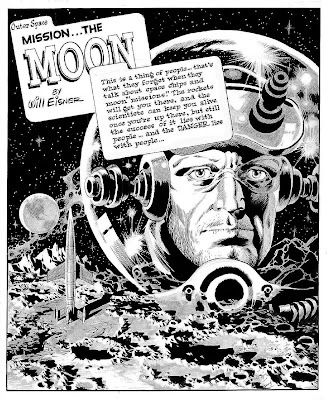 "Mission... the Moon" was published August 3.